Testing will be carried out from 10.00 am to 2.00 pm at Wohl Enterprise Hub, 2B Redbourne Ave, London N3 2BS on Sunday 10th February. If someone has a blood cancer, such as leukaemia, then the only chance of saving their life could be a stem cell transplant. But those stem cells have to come from someone with a matching tissue type, which, if you are Jewish, is far more likely to be from someone who is also Jewish. How do you know if you are a match? With a simple swab of your cheek, your saliva can be analysed, and your tissue type recorded on the national register. Anybody who needs a match has their tissue type compared with all those on the registries around the world. There’s a slim chance you’ll match someone (4-5% over 10 years) but if you do, you could be the one person who can save that person’s life. Then, 90% of people donate through their bloodstream over an afternoon. The Sue Harris Trust urgently needs to replenish the registry with a new generation. There is now a clinical preference for younger donors and of course, they can stay on the register for a longer time. 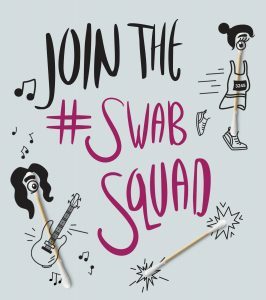 Jewish Swab Week is a great opportunity to add yourself to the register – you just need to be aged 16-30, and in good health. It takes literally a few minutes to be swabbed, and if you are a match, you would be giving someone decades of life. How many chances do you get to do that?